I think it’d be true to say that Melbourne hasn’t done high-density development in the suburbs very well. For example, this monolith in Camberwell, a bit too far away from the railway station, out of scale with (some of) the buildings around it, and I’m sure not well liked by many of the locals. But that doesn’t mean high-density around railway stations is a bad idea. The topic came up yesterday in an Age report that Metro’s plan to upgrade the Dandenong includes such development around stations such as Murrumbeena. Residents of Melbourne’s politically sensitive south-east face the possibility of high-rise development at their rail stations including Murrumbeena, under a confidential deal between the Napthine government and a consortium led by the city’s private rail operator. The deal for the proposed multibillion-dollar upgrade of the Pakenham-Cranbourne rail corridor – contained in documents leaked to The Sunday Age – includes a specific clause about development around sites identified for level crossing removals. In some ways this shouldn’t be any great surprise — Metro’s parent company in Hong Kong makes a lot of money from development around stations, and there’s been a lot of talk in the past few years about development around stations helping to pay for grade separation. The tiny (in comparison) development of a cafe at Caulfield was a flop, but a grade separation, new station and re-development of the whole precinct would actually work… if done well. Population growth is happening. Planned, targeted in-fill development is better than never-ending sprawl, and better than a free-for-all that destroys local streets and leads to more car dependence because you get lots more people living where public transport isn’t convenient. I’ve lived in Murrumbeena twice — for a couple of years last decade, as well as in the 80s when I was a teenager. In that time the shopping centre has always moribund. To an extent, the railway line split it east-west, and the busy road split it north-south, and it could never compete with Chadstone and Carnegie, both nearby. Getting a lot more residents in the immediately vicinity of the station could re-vitalise it, and make much better use of the land currently used for parking. I’m not sure about how high they should go. Chris Hale proposes 15 stories in The Age article; having seen the blocks go up around Footscray, and the Camberwell example above, I don’t think in most suburbs (outside the inner city, at least) you’d want to go above 8-10 for now, staggered downwards as you get further from the centre/station. given much of the most obvious land for development is currently station carparks, I’d imagine it might be politically courageous to end up with a net reduction in car spaces, though improvements in bus services could counter this. A reduction in spaces is perhaps avoided via development such as in Elsternwick, where existing parking was converted to multi-storey. The fact that this one is being planned in secret is obviously a concern. And is Metro’s “value capture” going to actually save the government (and taxpayers) any money? It’s not clear. But that doesn’t mean that the concept high-density around transport hubs is a bad idea, provided the community get some say, and if it’s done well. Based on past Melbourne experiences, that’s a big if. What’s your thoughts on the upgrade of Glen Waverley station? Apartments, ToD etc? The theory is ok, but there needs to be tight rules about developments instead of allowing developers to go to the extreme maximising of profits by overdeveloping. Murrumbeena is a low rise area, so we shouldn’t see anything much higher than five storeys with a decent stepped set back. As awful as that Camberwell Junction building is in the photo, viewed from the eastern Riversdale Road hill truly shows what a blight it is. I think the proviso should be that architects are not allowed to design buildings. I would not describe the main section of the Murrumbeena shopping strip (Neerim Rd north of the station) as moribund. It could be more vibrant but it has quite a number of shops that appear to be doing reasonable business and the station is busy as well. The density in the immediate Murrumbeena station is increasing as more flats are built on the main roads around there. Current or previous automotive establishments seem to be a significant target. Indeed, I think the value capture argument for these things works, but it has to be integrated properly with the surrounding area (that can, of course, mean larger buildings than what’s there; and can of course mean modern design). As for that Camberwell thing, it’s an ugly building, with far too much floor space for the given site. Its unfortunate juxtaposition with a heritage building is seems likely to be the result of a “heritage-by-numbers” application of the letter of the rules, rather than the spirit. Was VCAT involved in that one? 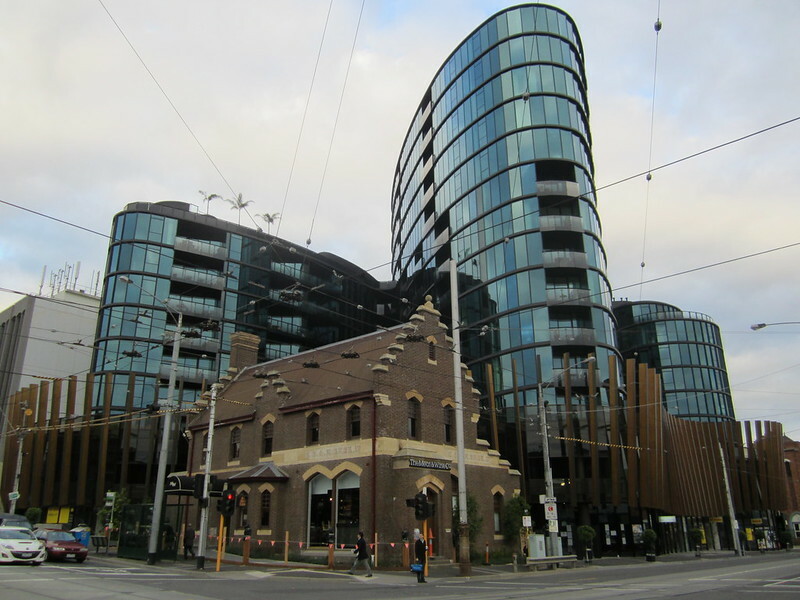 Unfortunately buildings like that are all over Melbourne; we don’t really do “planning” here (just an approval process). Population growth is NOT inevitable. Developers donate to pollies to get population growth policies. Support the Sustainable Population Party. Simon, The apartment block at Glen Waverley station probably kills the option of extending the GW line or at least makes it more expensive. With Doncaster, there are apartment blocks galore but no spot identified and earmarked for a station to be built. (How about the Officeworks site?) So the Doncaster Station may have to be deep underground for enormous expense. London is building a station that sticks out from the middle of the Thames River (Canary Wharf Crossrail Station). If we ban apartments from coming up at the Officeworks site, we can have a station there. The issue with “limit of one car park per residence, with the option of none” is that residents then park their second car on the street. Most families or even twinkies (two incomes, no kids) I know still keep two cars even when they only need one or both cars occasionally on weekends. Discouraging car ownership and use should be a separate, targeted policy exercise. And the problem with people parking on the street is? Parking on the street can cause a multitude of problems, as there simply isn’t enough room for hundreds of new apartment tenants to park on limited local streets. However, simple solution: make the local streets permit zones (for longer than say 2 hours) and don’t give anyone permits if they live in an apartment block. I’m pretty sure that’s a current standard among local governments anyway. If residents try to get away with it and park illegally without a permit, hit them with continuous fines, and if they offend multiple times, then take them to court and deal with them.